Our Kamloops contemplative group has evolved through several incarnations over the years. Initially we were simply four people in our local parish who were getting together weekly to share our stories and to “pray”. That was some twenty-five years ago. Four years into our existence I found myself at a week-long workshop-retreat on Centering Prayer given by Cynthia Bourgeault and was profoundly affected by both the practice and the teachings upon which it was built. After what was, for me, fifty years in the spiritual wilderness I felt that I was being given an utterly new way of approaching and even entering the Mystery that we called “God”. When our group commenced meeting again that fall, the other folks had the courage to leap into the void with me and we began meditating at our weekly gatherings. As anyone who has done the practice knows it was not an easy undertaking. Simple, yes. Easy, no. We had differing responses to the practice: I took to it (*seemingly) like a fish to water; someone else had monkey-mind; one found that her thoughts were utterly relentless; and another found it distressing in the extreme – all but impossible given his personality. Nonetheless, we each of us persisted. Flash forward five years we decided to open the doors to the wider Christian community (through personal invitations as well as church bulletins) in the hopes that this contemplative meditation/prayer practice might find some fertile soil outside of our small group. To that end we asked Cynthia to come and meet with us and give us her advice. Out of that time together, we decided to begin meeting twice a month as a larger group. That group came to be made up of people active in many Christian spiritual traditions (Roman Catholic, Anglican, United, Baptist and Quaker). Over time it has also included Unitarian Universalist and others. We’ve continued meeting twice a month for an hour and a half for the following fifteen years. (Monday evenings seem to be when most people are free, and we hold them on the second and fourth Mondays of each month from September through May regardless of whether they fall on a holiday or not – moving the Mondays to accommodate for holidays proved too confusing for folks.) We held our gatherings for a long time in a small Roman Catholic church after which we moved to the local Anglican cathedral – where we now meet. The structure of the two Mondays has varied over the years – although our bedrock every time is twenty-five minutes of Centering Prayer and as much chanting as we can manage. We began by doing multi-yearbook studies on Cynthia’s first Centering Prayer book, on Kabir Helminski’s “Living Presence (aided by Lynn Bauman’s workbook) and on The Gospel of Thomas (using Lynn Bauman’s translation and commentary). There have been shorter explorations of other books as well – in particular “The Cloud of Unknowing”. What we discovered over time is that there seemed to be a desire to go deeper than a head “understanding” of what the texts were saying. To that end we would break off into groups of four or five and apply the teachings to what we were experiencing in our own lives. While there was a good deal of discussion there were two difficulties: one was that while some people were more extroverted and willing to share, others were more introverted and reluctant to do so; the other was the issue of having to have one person in the group act as a leader – which put undue pressure on that person. After much trial and error, we’ve come to something that works for us. What we’ve been doing for the past half-dozen years is the following: Our fourth Mondays are almost exclusively meditation and chanting – two twenty-five-minute sits are broken up with a walking meditation plus chanting at the beginning, the end and between the two sits. We discovered that people wanted more and more silence. And simple chanting,chanting, chanting. Our second Mondays have one twenty-five-minute sit along with chanting at the beginning and the end. The rest of the time is spent doing Lectio Divina. Typically, it’s the Gospel reading for that Sunday –although all that’s required is that the reading is from scripture. The format is whatever the individual leading the evening chooses – but, again, silence is key. One format is: reading once through when we simply be with the reading followed by silence of a couple of minutes; the next reading (from either the same translation or a different one) is followed by more silence but this time we engage with our senses and feelings; after the final reading we speak the word or phrase that struck us and ask “What’s moving inside me? Inside my heart?” People can then choose to speak to whatever emerges from that place. We can ask questions of ourselves, identify what we’re feeling or speak directly to God or to Jesus. There are no rules here beyond those of voluntary participation, confidentiality and no crosstalk. Perhaps something that someone else says might speak to what you’ve needed to hear. Perhaps you’re lost or frustrated. No rules. We simply open to the movement of God in our hearts – as best as we are able at this moment. At the end of each gathering we have prayers of intercession/thanksgiving followed by chanting the Aramaic Our Father. There have been times during the group’s evolution when “thlipsis” was the order of the day. It hasn’t always been easy. We’re human beings attempting to move beyond the small, narrative selves of personality and into our True-Selves-in-Christ. It’s a leap – and struggle and conflict do arise. The issues that people have raised have, almost exclusively, to do with the format of our gatherings. We’ve actually used Survey Monkey to make certain that we were moving in the direction which the group wanted to head. It’s an ongoing discernment. We also gather one Sunday a month to hold what we call a “Eucharistic Communion”. It follows the typical Mass structure (chanted Kyrie; chanted Psalm refrain; Gospel read twice; Lectio; reflection by the presider and others as they see fit; Communion; and a chanted Aramaic Our Father– the fewer words the better). The presider is typically a lay person. The Communion itself includes chanting the Hebrew blessing over the bread and before drinking wine – which, presumably, Jesus intoned at the Last Supper. Finally, we hold a year-end celebration – beginning with a Eucharistic Communion followed by a potluck supper and much joy and reverie. Whatever it is that happens in our little contemplative community one thing is for certain: It is authentically responding to the moving of Spirit. Of that I am certain. *My experience of Centering Prayer must wait for another day. P.S. We also have a library of eighty-plus titles purchased over the years on the Christian contemplative Wisdom tradition. Teachers include Cynthia Bourgeault, Richard Rohr, Matthew Wright, Michael Fish and others. In the last week of September, The Contemplative Society welcomed Mirabai Starr to Vancouver Island for a retreat entitled “One Heart: Weaving a Tapestry of Inter-spiritual Community” at Cowichan Lake Research Station, a first collaboration between our organization and this renowned author, translator of the Mystics, and speaker. While she is perhaps best known for her memoir Caravan of No Despair, in which she chronicles her many tales of love, loss, and transformation, we were interested in her expertise on and authenticity in walking the inter-spiritual path. Though we expected to learn much from her on this subject and were thoroughly satisfied by her teachings, what we didn’t expect was the tangible transformation she helped usher among a group of women from various cultural and spiritual backgrounds, different degrees of previous experience and knowledge with the subject, and varying levels of comfort with the practices we were encouraged to try. Over the course of four days, Mirabai held us tenderly and confidently, helping us foster our listening skills through triad work, harness our written voices through contemplative writing practices based on Natalie Goldberg‘s method, and reacquaint our hearts with our Beloveds as foundation for social action in our world. As testament to our time together, and to share with the world our gratitude to Mirabai and each other for this demonstration of hope and possibility, below are two reflections graciously written by retreatants. Their similarities and differences help exemplify what can happen when unity is born out of diversity, when One Heart beats in many. Deep thanks to Mirabai for sharing her warmth, honesty, and skills; she indeed wove together threads of disparate interests and backgrounds into a Tapestry of Inter-spiritual Community. 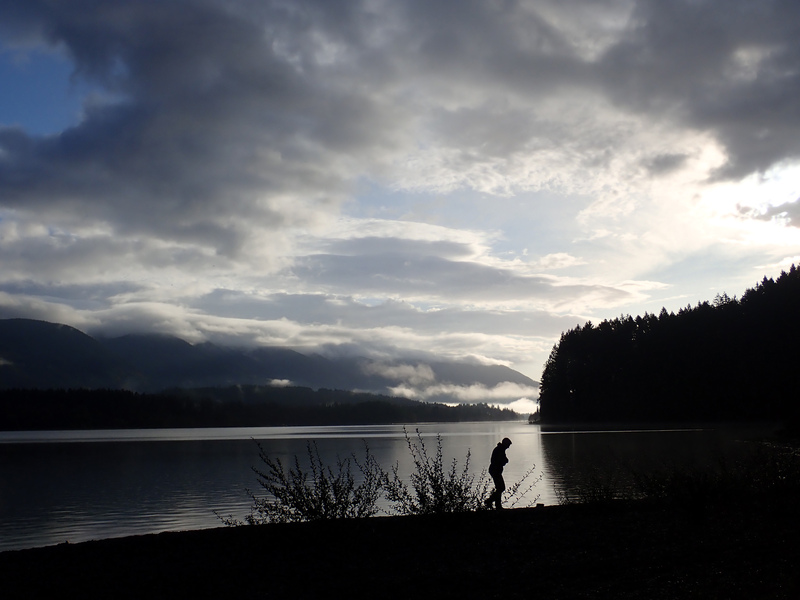 My first foray into The Contemplative Society began with my immersion in Mirabai Starr’s retreat at Cowichan Lake, though my contemplative life started long before. Being one of many Americans whose spiritual path and questing has brought me on a meandering journey, mine began with a Catholic childhood with very liberally minded parents, an Irish Catholic father from the Bronx, and a German born mother who grew up with a Jewish-turned-Anthroposophist father and a Lutheran-Swiss mother working with Rudolph Steiner’s teachings. In my own young adulthood, I turned to yoga and Buddhism, seeking more direct embodied experience of my soul and inner life. I find myself now on a return trip to my Christian roots, while being on a contemplative path and still teaching yoga in its fullness, not separating it from its spiritual roots. Naturally, an inter-spiritual path seems an inevitable part of the plot. 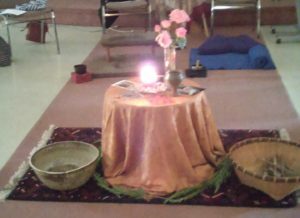 I am married to a spouse ardently ordained as an Inter-spiritual Minister, so when “One Heart: Weaving an Inter-spiritual Community” with Mirabai Starr was offered by The Contemplative Society, I had an intuitive draw and a natural inclination to register for the retreat. Mirabai has knowledge in a wide variety of the world’s religious and spiritual traditions, and shares this generously, clearly reflecting her own experience walking a deep path of inter-spiritual life. While there is a common prejudice against those who take on many rather than a single path, for me Mirabai is one who lives with a breadth as well as depth I have seldom witnessed. We heard teachings from Teresa of Avila, Julian of Norwich, St. John of the Cross, as well as many readings from one of her many books, God of Love, which explores the common heart of the Abrahamic traditions. We learned of Jewish practices, Muslim teachings, and sat in the beauty of contemplative community silence. On Friday evening a Shabbat service blessed us with a beautiful challah bread, the glow of candlelight, sacred wine, and apples dripping with honey. We gathered together, our heads shrouded, our hearts opening in the intimacy of feeding and being fed, tasting the sweetness of life, and bringing forth the remembrance that Sabbath practices must be resurrected, brought back into the foreground lest we forget such essential goodness in our lives in what Thomas Merton called the “rush and pressure of modern life” during the twentieth century. Mirabai clearly cares deeply for the world, and actively conveys her sense of willingness to enter the dark realms that inevitably emerge in our own lives, as well as globally in our contemporary world plagued by environmental problems and those of social justice. Mirabai’s weaving of elements of Sacred Activism into the tapestry of our time together, stands as a central thread as I gratefully reflect upon this retreat. She upholds the essential message of the Good Samaritan or the Bodhisattva, that we are called in our spiritual engagement to be clear that awareness and action related to the world’s suffering must be held, and acted upon. Life’s pain and life’s beauty, in its most essential poignancy flowed like a river through the retreat, and Mirabai’s deep willingness to be open and transparent, truly humble and loving, have made an indelible impression on me. In my imagining, the circle of participants initially gathered around the teachings and exercises with curiosity, and perhaps with a little skepticism on the parts of some, and, by the closing of our time, it seemed clear that we had indeed created together an inter-spiritual community with one heart, even a bit challenged to release ourselves from a beautiful holding and step back into our ordinary lives. I have been carrying the connections in my heart and into my work in a deeply satisfying way. I am so grateful for all those who made this rich opportunity possible, and for the refreshed inspiration and hope with which I am now moving in my life, and my work. I look forward to paths crossing again with those who gathered for this wonderful immersion. As we drove in, old growth forest on one side, straight rows of seedlings on the other, our pace slowed, our senses opened. Warmly greeted and shown our rooms, we settled in. The shore line and silvered lake, right there, beckoned. The peace of the wild was all-surrounding. We had come a variety of distances, for a variety of reasons, most of them because of Mirabai. Some of us had read one or more of her books. Some of us had met her before, or taken one of her on-line courses. Some of us had barely heard of her. Most of us met Mirabai for the first time as we gathered in the dining hall for dinner. All women standing in a circle, singing the simple grace she taught us, I felt the beginning of something significant. That evening in our first session the “something” began to take shape as we introduced ourselves and shared our aspirations for the retreat. Although Mirabai sat guru-like in front of us and would be our teacher-leader for the four days, I felt we were a circle of equals where everyone belonged. The days were spaciously paced. A Great Silence held us through nights, morning meditations, and breakfasts. Live music from a Celtic harp invited us to gather for each teaching session. Several times in a day, Mirabai divided us into small groups and gave us opportunity to share what we were experiencing. In the afternoons she gave us prompts for stream of consciousness writing, then invited us to listen to each other’s unearthed gems. Unhurried, without any sense of obligation, I felt free to simply BE in each moment. Mirabai brought me into places of deep listening by reading to us. She read poems from the great mystics, prayers to the Divine Feminine, and excerpts from her several books. She taught freely and knowingly from her early experiences in Hinduism, Buddhism, and Sufism. She shared how her love for Christ grew as she translated John of the Cross, Teresa of Avila, and Julian of Norwich. She sprinkled times of silence throughout her teaching. Friday evening her Jewish heritage came alive as she led us in the ritual of welcoming Shabbat. With our heads covered we prayed facing each direction. 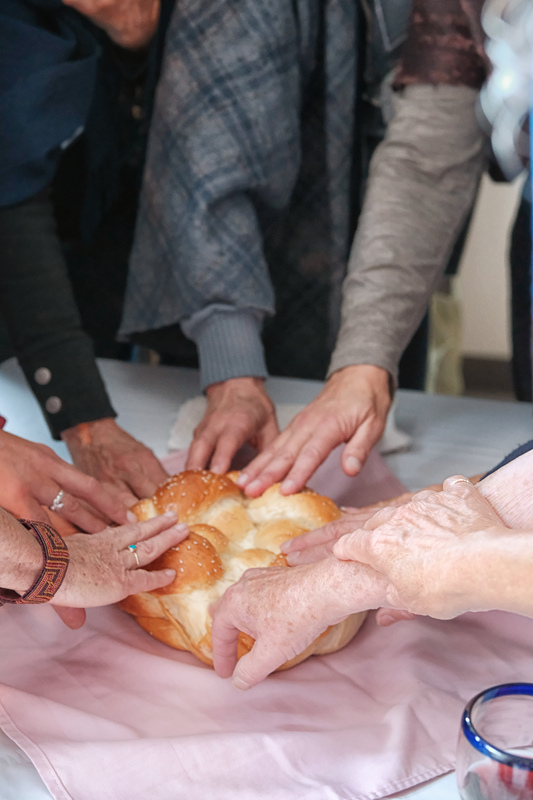 Then gathering in close, we blessed the beautiful Challah loaf and tore off pieces of its moist sweetness to feed each other – a simple act of tender intimacy. As the chalice of wine passed around I knew I had been invited into deep rest. Our hearts were kindled with loving-kindness. The wound of suffering is the portal to the Beloved. Jacob’s example tells me it is my birthright to wrestle with all the teachings, and make them my own; if Love is not there, leave the teaching behind. The longing itself is the path. I don’t have to believe everything I think. Stay still, stop meddling, and let God paint my portrait. God, who is ever with me, cannot come to visit me unless I am not there. The moan of separation is the cry of union. If I take one step toward God, God takes seven steps toward me. If I run toward God, God rushes toward me. Sin has no substance except by the pain it causes. The inter-spiritual way is to travel through the wilderness with open hands and drop to my knees wherever I encounter Love. Love affirms our essential connectedness. It is all about Love. All will be well, and all will be well, and every kind of thing will be well. In our last session on Sunday we went around the circle sharing the ways our hearts had been opened. 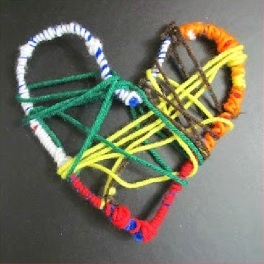 What I had felt on Wednesday had evolved into something like a woven garment, a prayer shawl, a love wrap, holding us in Oneness. Days after our goodbyes, its blessing lingers. Thank you each one, thank you Mirabai, thank you Amma God. Many thanks to Anne Voegtlen for the photos, and to Elizabeth and Mary for sharing their experiences with us. To increase your chances of attending one of The Contemplative Society’s retreats with celebrated teachers such as Mirabai, consider becoming a Member. Members receive the first opportunity to register for our retreats. To join, visit our Support Us page. Liz Vickers, board member of The Contemplative Society, reflects on her recent experience preparing and “post-holding” for the Quiet Day celebrating the Feast Day of St. Mary Magdalene. On July 22nd, the Feast Day of St. Mary Magdalene, I drove with a friend out to Metchosin – by my request, in silence, so as to be quiet and grounded for the day. I was well prepared to lead the Quiet Day with Eileen; well prepared, and a bit nervous. I have organized and attended many retreats and Quiet Days with The Contemplative Society, but this was my first time as a “post holder”. In preparing for the event with Eileen, meeting with her and exchanging ideas to co-create the shape of the day together, I learned so much from her about how to go about constructing a container for our practice. 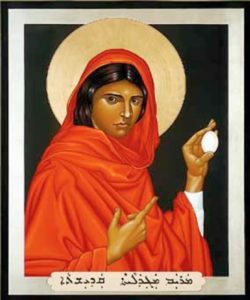 Re-reading The Meaning of Mary Magdalene by Cynthia Bourgeault, I learned a lot about Jesus and about his relationship with his Beloved, and how the church came to deny Mary her true role as Apostle of the Apostles. This process of preparation taught me a lot about myself while deepening my understanding of this saint, but it was only the beginning. When the day came, we gathered, fifteen of us, both experienced meditators and some who were new to contemplative practice, in St. Mary’s Anglican Church at the top of the trail head to Whitty’s Lagoon. We sat encircling a small round table, an altar with icons, roses and rose petals, and a red candle, red being the colour often associated with Mary Magdalene. After a welcome and overview of the day, we entered more completely into the space with a short guided embodiment practice. We did this briefly at various intervals during the day and were reminded to listen with our hearts, the organ of spiritual perception. The background to the day was silence – it was tangible. We chanted Be Still and Know That I Am God, and sat. Sitting in silence with others in a beautiful place: I can’t think of anything better to do on a Saturday in the summer. What was it that stirred in me so deeply leading up to and during this day? This led into a profound meditation. Sitting and going deep within I saw or felt the image of the chalice that was my heart, open and available for Presence to enter. During the Quiet Day, I loved the sense of Mary Magdalene that was with us in the celebration of her Feast Day. We chanted inside the church and outside on the grass, prior to meditation and in body prayer. We thought of her as the Samaritan woman at the well whom Jesus asked for a drink from as we chanted in a circle on the grass the chant Let All Who are Thirsty Come. We chanted it as Grace before eating lunch, just as they do at the Taizé community in France, a place where a door opened in me that I never knew I had. France, where legend has it Mary became a hermit in a cave at Saint-Maximin-la-Sainte-Baume after Jesus’ death. We poured ourselves into movement as we chanted Take O Take Me As I Am, recalling the Song of Songs, imagining Mary speaking these words to Jesus, her Beloved, and making these words our own. During the two-hour break at noon, I went down the trail to Sitting Lady Falls and listened to the sound of the cascading water, smelled the green smell of the leaves, and soaked up the beauty and the stillness of the trees. The idea of being a post holder in today’s world was given meaning through a beautiful ritual. Eileen talked about what it meant to be a post holder, with the example of Mary Magdalene, who stood faithfully by her Beloved in life, through death and resurrection, and who carried his teaching forward as the First Apostle. As we listened, each of us held a twig taken from a basket that was handed round. Then we each placed our twig in a bowl filled with sand and silently made a pledge to be a post holder in our own unique way. My pledge was to show up, and to keep showing up. The twigs formed a beautiful symbol for the day and our group, each one an individual, and all forming together an intricate and beautiful pattern. And, again, the image of a receptacle that was available and ready to be filled came to me. The chant What We Need is Here was followed by a sit. Spending a day in retreat is one thing. Taking with you what you have experienced into the world of everyday living is the challenge. After our final sit we finished with a reading from an article (“We Were Made For These Times” by Clarissa Pinkola Estes). Then we left the room in silence and stood in a circle outside. A raven talked to us from a branch in a fir tree above us against the backdrop of the deep blue sky. The day was complete. I loved spending time with this unique group of people. It seemed to me that everyone who was meant to be there was, and that each person present had an equally important role to play. After the lunch break, having spent the morning in silence, we had stood in a circle and each of us in turn said our name, and our name was repeated back to us by everyone present. It was a beautiful expression of the contribution that each of us made, and of the support that we gave and received to and from each other. Feeling that we were all equally responsible for the day, it was much harder – though not impossible – to feel self-conscious. At the end of the day I felt relief that things had gone so well. I felt refreshed and filled with gratitude: gratitude for the opportunity to be a post holder, to Eileen for inviting me, and for her wonderful teaching, and to Mary Magdalene for lighting our way. For more on Mary Magdalene, explore our audio teachings by Cynthia Bourgeault, Mary Magdalene & the Path of Conscious Love and Through Holy Week with Mary Magdalene.